Can These Three Nuxe Products Make It To The Parisian Beauty Essential List? Bonjour! 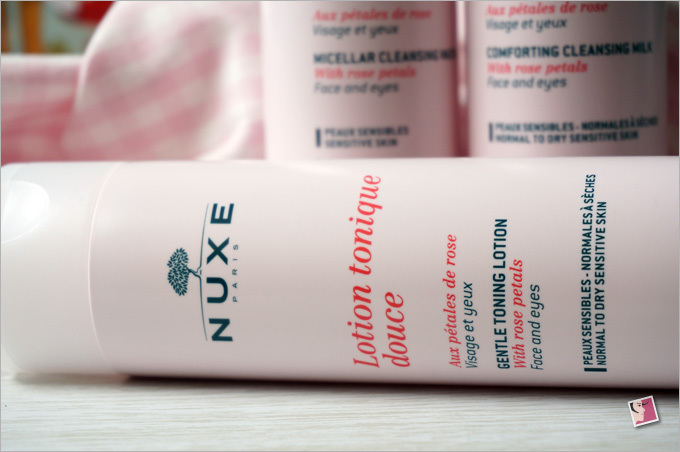 Today, we’re taking a peek at Nuxe, a French brand that’s been helping Parisian women maintain beautiful skin the natural way. Familiar with Nuxe? I’m not surprised. After all, the brand has been around since early 1990s and can be readily found at French pharmacies and Watsons closer to home. But for those who don’t know, Nuxe is a popular pharmacy beauty brand from France with a wide range of plant-based natural skin and hair care products developed by their very own R&D team. 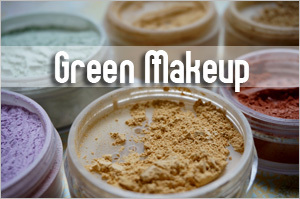 All their products are formulated with natural ingredients without parabens, mineral oil and ingredients containing animal extracts. 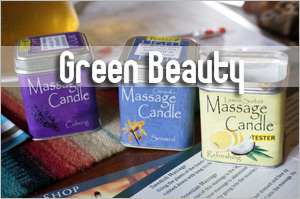 The amount of natural ingredients used is indicated on each product. 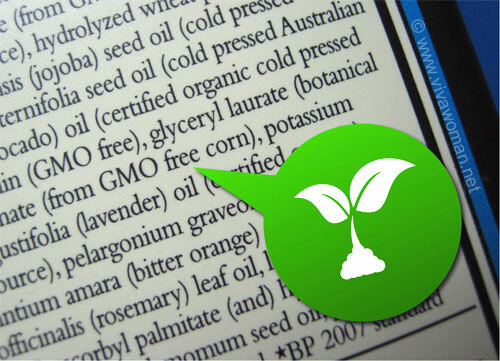 The three products I’m about to review contain over 90 percent natural ingredients. 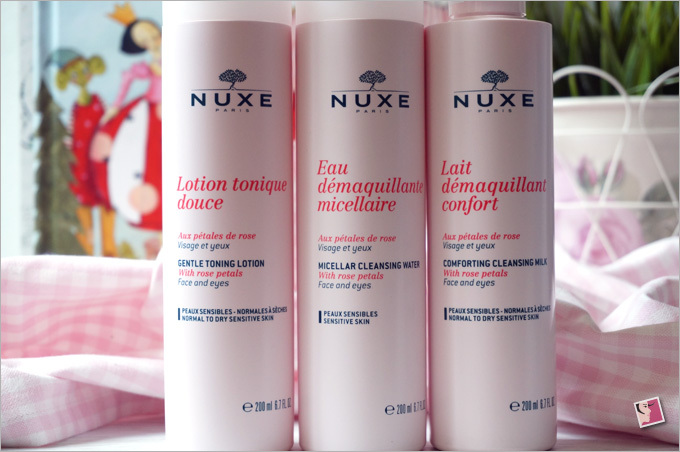 Nuxe has a score of cleansers to meet very cleansing need. I picked up this Comforting Cleansing Milk With Rose Petal that is supposed to cleanse and remove makeup for both face and eyes. 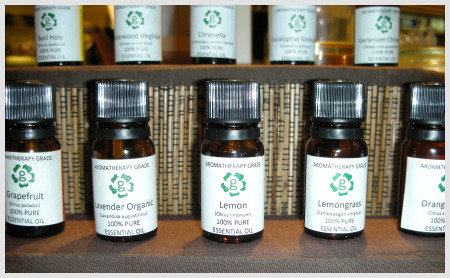 This product is said to be formulated with at least 94.1 percent natural origin ingredients and no parabens. 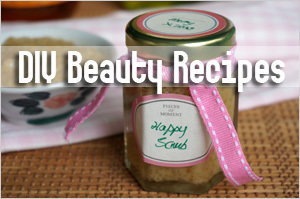 It also contains hypoallergenic fragrance specifically developed for sensitive skin. Aqua/water, rosa damascena flower water, macadamia integrifolia seed oil, cocos nucifera (coconut) oil, c14-22 alcohols, parfum/fragrance, glycerin, hydrogenated coconut oil, propanediol, benzyl alcohol, c12-20 alkyl glucoside, capryloyl glycine, tocopheryl acetate, tocopherol, sodium hydroxide, carbomer, citric acid, sodium cottonseedamphoacetate, acrylates/c10-30 alkyl acrylate crosspolymer, helianthus annuus (sunflower) seed oil, allantoin, tetrasodium edta, dehydroacetic acid [n2306/a]. 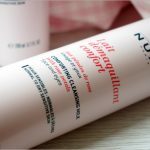 Nuxe Comforting Cleansing Milk feels creamy but is not too thick. Just two pumps is sufficient for my face. It doesn’t cleanse my eye makeup as well though unless with the aid of a cotton wool. But I’m not complaining because it does a fine job on my face without need for a wash cloth or sponge. I can use this product either as a first cleanser, a second cleanser or as both my first and second cleanser in my double cleansing routine. It cleanses my face well, even on first wash. No greasy or icky residue, no tightness and no dryness even if I use it a second time. I love that the idea of rose petals in the formulation-the scent backs that but it smells more like a sweet perfume to my untrained nose. Kind of reminds me of some body powder that I’d used in the past. This cleanser is not the best cream/milk cleanser I’ve used but it is definitely on the top three list on the scale of effectiveness. I’ll definitely repurchase this again. 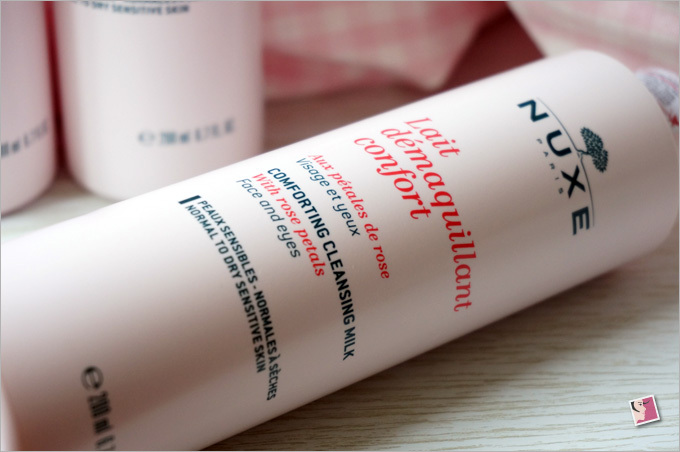 Some of you will probably feel uncomfortable with the price of this cleanser. A 200ml bottle cost S$40. But if you like gentle cleansers that are milk or cream based, try getting this the next time you chance upon a sale at Watsons. I believe you will like it too. This product hails from the country where micellar cleansing water first began. 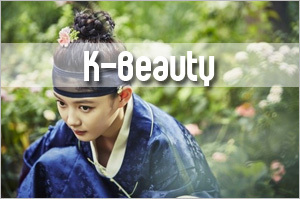 It’s said to be a 3-in-1 product that cleanses, purifies and softens. 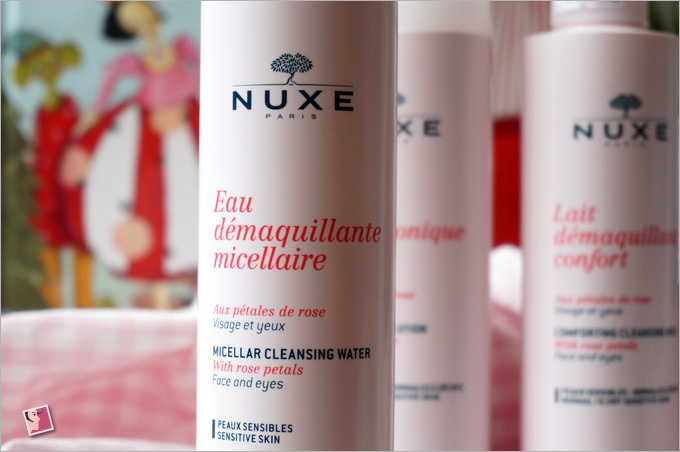 Nuxe Micellar Cleasning Water contains at least 97.4 % of natural origin ingredients and no parabens. 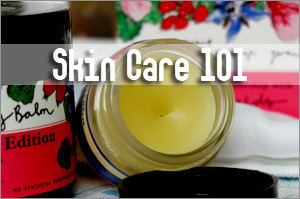 Again, it contains hypoallergenic fragrance specifically developed for sensitive skin. Aqua/water, rosa damascena flower water, glycerin, parfum/fragrance, benzyl alcohol, capryloyl glycine, citric acid, coco-glucoside, sodium hydroxide, allantoin, caprylyl/capryl glucoside, tetrasodium edta, dehydroacetic acid, sodium hyaluronate, linalool [n2305/a]. I haven’t used that many micellar water so I’m not certain if they differ all that much. Nuxe Micellar Cleansing Water feels and smells like a micellar cleansing water I’ve used before but with a tad less suds. 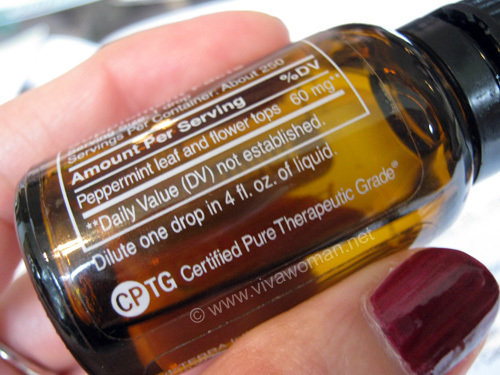 I use it on some days as a second cleanse or first thing in the morning. It lives up to its promise and I like that it leaves my skin clear and soft. Price wise, it cost the same as the milk cleanser. A 200ml bottle costs S$40 too. Like I mentioned, you might want to consider buying this during a promo. For those who have not tried using micellar water, you can read my post on the different ways to use micellar cleansers. 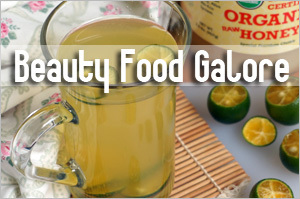 If you live in a country where water is hard, this no-rinse formula will be good for your skin. I recommended it to a colleague and she loves it because it is so convenient. Aqua/water, rosa damascena flower water, hamamelis virginiana (witch hazel) water, glycerin, parfum/fragrance, benzyl alcohol, capryloyl glycine, citric acid, sodium hydroxide, allantoin, coco-glucoside, tetrasodium edta, dehydroacetic acid, caprylyl/capryl glucoside, sodium hyaluronate, linalool [n2301/c]. 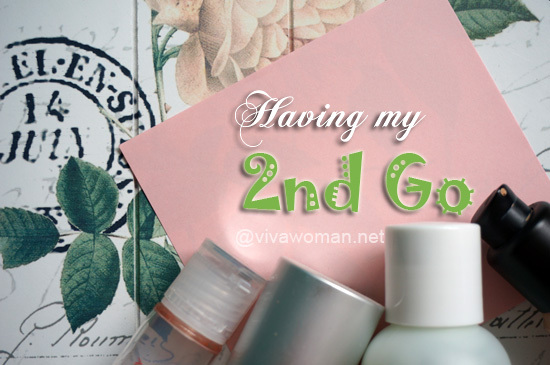 I find myself reaching out for this toner after cleansing my face. 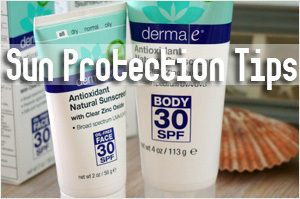 It helps to hydrate my skin at the same time balances the pH level of my skin. But even though I like it, I’m not keen on paying S$40 for a 200ml bottle of toner. So I’ll only recommend this when during a special promotion. I don’t understand why the products are named “with rose petals” when I don’t see a shred of petal in any of them. I’m also not crazy about the artificial rose scent. 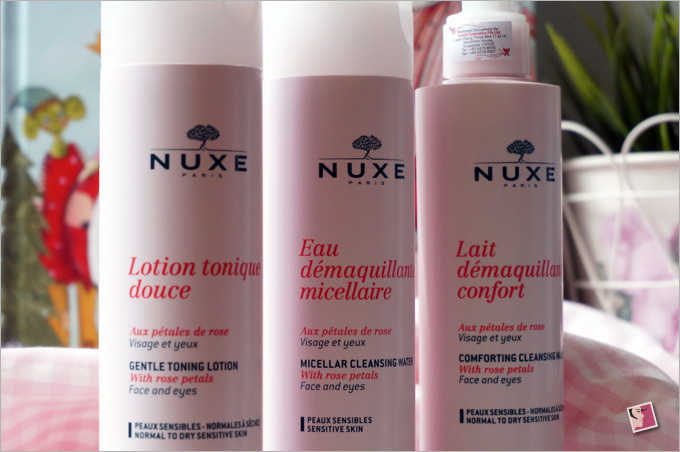 But overall, I like these Nuxe products especially the Comforting Cleansing Milk and I think they can make it to the Parisian beauty essential list. Heck, I even like the feminine vibes through their pink packaging. While I don’t quite mind paying S$40 for a 200ml bottle of cleansing milk, I’ll probably prefer to wait for a sale to repurchase the other two. If you’re keen to try out these, I would suggest waiting out for a sale to take advantage of lower prices. 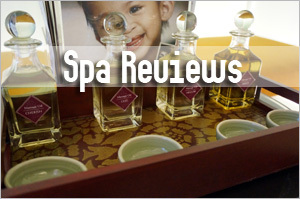 If you’ve tried something from Nuxe that you like, do share your comments with us. 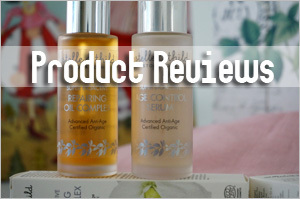 Products highlighted were purchased and this review is in line with my disclosure policy. 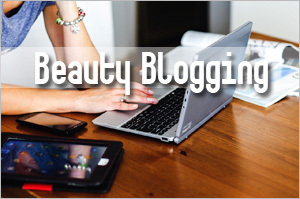 nice content.but i want cleansing milk minimum range not so high. thanks.